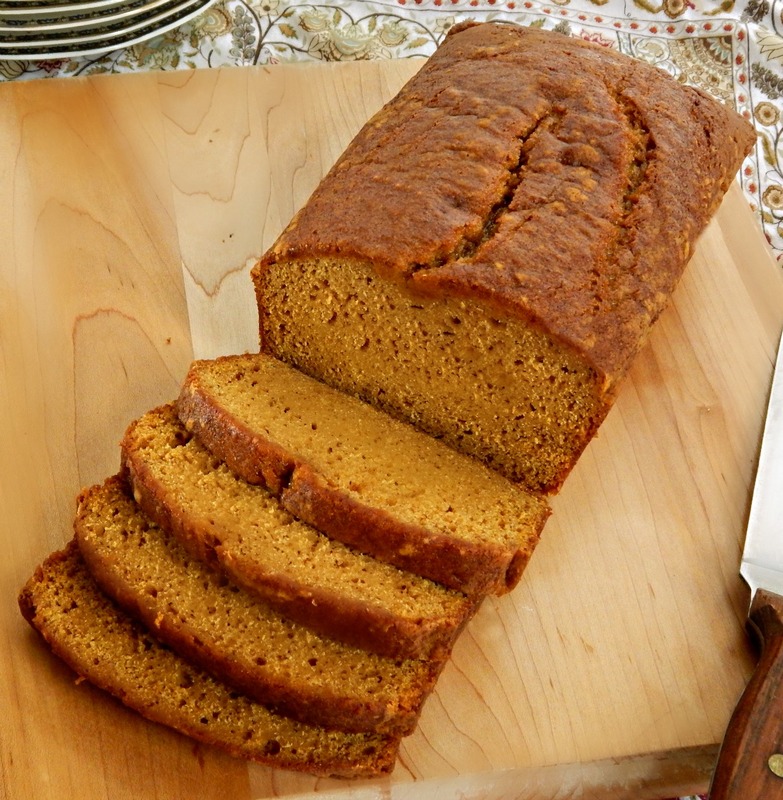 My Grandmother’s Pumpkin Bread, to me, is the “pinnacle” of Quick Breads. It’s a gorgeous bread, very moist, perhaps just a bit dense, and redolent of spices that signify fall. Heavily flavored with spices that must have, at one time, been quite exotic: cinnamon & clove. I never saw my Grandma’s recipe box until after her death, and as I went through the yellowed, faded cards I saw recipes that were familiar (Salmon Loaf, Ham Loaf, Apple Cake with Caramel Rum Sauce – go Grandma!) and others not (Prune Whip). Her Pumpkin bread, though; this one I set aside. I knew I’d be making it very soon. Back in the 60’s, no family gathering was complete without an array of quick breads, served on a platter. Walnut, Date Nut, and of course the ubiquitous Banana Bread always put in an appearance, but this bread was my all out favorite. The recipe makes two loaves, and freezes well, but make one for home and bring the other to your next fall gathering or to the office. You’ll find, I think, that everyone will be absolutely charmed. Cream shortening with sugar, add eggs, pumpkin and water. In another bowl, sift together rest of ingredients, or place in bowl and whisk together. Add to pumpkin mixture. Pour into two greased loaf pans and bake for about one hour at 350 degrees. (This may vary depending on what size you use – the bread will darken a bit and crack. It’s done when a toothpick put about halfway between the edge and the center comes out with a few moist crumbs.) As with all baked goods, do not overbake. Note: I usually bake this in a 9 x 5 bread pan because I have two – it is slightly more elegant looking (taller) when baked in an 8 x 4 pan. If you bake in a Pyrex pan, turn your oven down 25 degrees. Use a coupon matching site! One of my favorites in my area is Pocket Your Dollars, but every store has a group of enthusiastic Coupon Matchers. Do not discount the savings! I check their site every week, even if I don’t “need” to go to the store and often find bargains I can’t pass up. Measure butter/shortening by displacement of water. When measuring Shortening, Lard or Butter that isn’t in sticks, use the displacement method. Fill a measuring cup with cold water, leaving out the amount you with to measure. For instance, in a two cup measuring cup, if you wish to measure 1/2 cup of shortening, fill with 1 1/2 cups of water. Add shortening until the level comes to 2 cups. Since it floats, you may need to press down slightly on the fat to submerge for an accurate measurement. Per Serving: 266 Calories; 8g Fat (27.1% calories from fat); 4g Protein; 45g Carbohydrate; 1g Dietary Fiber; 42mg Cholesterol; 314mg Sodium. Exchanges: 1 Grain(Starch); 0 Lean Meat; 1/2 Vegetable; 1 1/2 Fat; 2 Other Carbohydrates. Although we like this plain with butter (and reheat it in the microwave for a moment with a pat of butter after it’s cooled) this bread would be wonderful in thick slices with a dollop of brandy spiced whipping cream, or even drizzled with caramel sauce. Two loaves for less than the cost of one small, rather mediocre loaf at the grocery store. I also know exactly what’s in it, and it takes only minutes to mix up. We sometimes eat quick breads like this for breakfast – it’s certainly no worse than many cereals or pancakes. I’m curious what you think of this Old Fashioned treat, Pumpkin Sweet Bread. We think it’s perfect for fall, or anytime! I hope you like it. This entry was posted in Click here for Fabulous Food Posts and tagged Breakfast or Brunch Dish, Easy Recipe, Family Recipe, Freezes Well, Frugal Hausfrau, Grandma's Recipe, Heritage Recipe, Pumpkin, Quick Bread. Bookmark the permalink. Since I moved the the U.K., I’ve had to learn to make this from actual pumpkins. No canned pumpkin here–they not only don’t know what it is, they can’t think why anyone would want it. Or why someone else would put it in a can. It’s more work, but it’s still good. It can be a little stringy, to tell you the truth. I wish you’d been along the time I went into a store and asked for canned pumpkin. If I’d set out to disrupt the place, I couldn’t have done better. lol! I can only imagine! I think some of these old recipes are the best. I think it must be the shortening. I think so, too, although shortening has always been considered to be more of a ‘cheap’ ingredient found in commercial foods! Brandy spice whipping cream? Whaaa? I’ve never heard of such wonderfulness! LOL, Lolly…I suggest you add a touch of brandy to sweetened whipping cream until you like the taste…if you go the other way around you might be overcome before you get it on the pumpkin bread….